[CONT](VC) Limit Break 4 (This ability is active if you have four or more damage):All of your «Neo Nectar» get "[CONT](VC/RC):During your turn, if you have a unit with the same name as this unit on your (VC) or (RC), this unit gets [Power]+3000.". 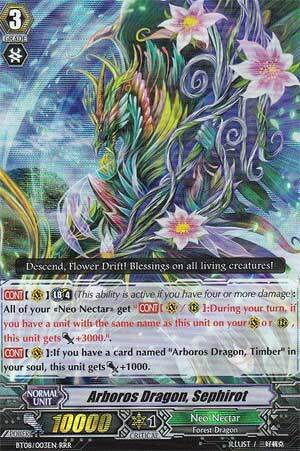 [CONT](VC):If you have a card named "Arboros Dragon, Timber" in your soul, this unit gets [Power]+1000. [CONT](VC) Limit Break 4 (This ability is active if you have four or more damage):All of your «Neo Nectar» get "[CONT](VC/RC):During your turn, if you have a unit with the same name as this unit on your (VC) or (RC), this unit gets [Power]+3000.". When this card came out for Set 8, a lot of Neo Nectar players (and even a few non-Neo Nectar ones) debated on whether they were going to swear oath to the Musketeers of the flowers or to the Arboros Dragon. For me, the choice was simple as a lot of local players claimed they were swearing to the flower brigade...that and I freaking love dragons, so I grabbed Arboros Dragon...and boy, was I ever glad that I did! The Limit Break is actually rather unique as its one of, if not the only, Limit Break that's actually a CONT skill rather than a ACT or AUTO skill like others. With that said, it allows all of your units a +3,000 power boost if there's a copy of itself on the field in which case, both units would be +3,000. Going back to that cloned Corolla Dragon; if Limit Break was online, then they would be 11,000 power boosters! That alone is enough trouble to force out a few cards in an opponent's hand. In short, the Limit Break is pretty easy to pull off whether its the Ride Chain or not and with the right field setup, could be a potential game ender!